Directions: From the High Street, turn in to West Stockwell Street which is the turning next to Town Hall, a few hundred meters down the road is Pizza Express. You take a left here onto St Runwald Street and you should see the sign on the right saying ‘Signals Media Arts Centre’ above a blue door. Most buses stop on the High Street a short walk away. Signals is a 5 minute walk from the bus station. Signals believes that everyone should have the opportunity to develop creative digital skills and gain a better understanding of media. The centre provides facilities, information, courses, projects and events to actively encourage involvement. We seek to engage all sections of the community and seeks to work with people who would not normally consider media participation. 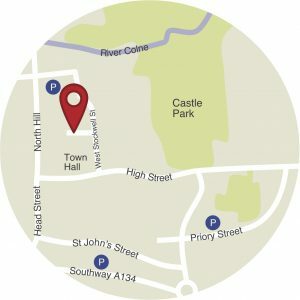 Parking: Signals has no on-site parking, the nearest parking can be found on the high street for those in possession of a disability parking permit and Nunn’s Road NCP car park, a short up-hill walk to Signals. Entrance: The front door is just off St Runwald Street. Entry is via a door entry system , the door is wheelchair accessible and as the door does not presently release remotely a member of the Signals staff will come to open the front door to all patrons. The ground floor of Signals is fully wheelchair accessible. Among the facilities is a ramp into the main studio, a disabled unisex toilet and downstairs kitchen. All public access courses take place on the ground floor. Should there be specific requirements that Signals cannot meet on site, Signals has portable equipment and we are easily able to relocate equipment and staff in an outreach capacity. Should there be any requirements for learning or physical support within our workshops Signals are happy to meet this provision by hiring qualified practitioners. Signals seeks to ensure its website is accessible and uses the web to exhibit films and provide information. Signals is also available to the public via Facebook, Twitter and Instagram, enabling comments and suggestions from users and potential users.